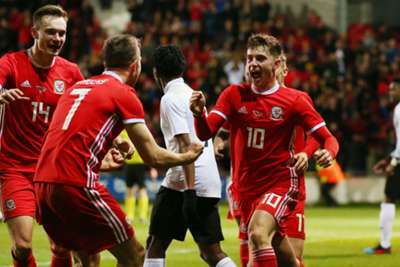 Wales got their 2019 off to a winning start as Ben Woodburn's stoppage-time goal claimed an unconvincing 1-0 friendly victory over Trinidad and Tobago at the Racecourse Ground. Ryan Giggs made nine changes from the XI that started the 1-0 defeat to Albania in November, with star duo Gareth Bale and Aaron Ramsey also left out. And though their absence was felt as Wales' inexperienced line-up toiled for much of Wednesday's clash in Wrexham, Liverpool forward Woodburn was on hand to bundle home in the 92nd minute. Things could have been different if not for Chris Gunter's goal-line block at the other end, but Wales will be buoyed ahead of their opening Euro 2020 qualifier against Slovakia. 90+2'' | 1-0 | GOOOAAAAALLLLL!!!! Ryan Hedges posed an early threat with a superb cross into Tyler Roberts, but he directed his header straight at Marvin Phillip. George Thomas went close to making Wales' dominance count when he dragged an effort just wide on the stroke of half-time, and the 21-year-old forced a fine save out of Phillip 11 minutes after the restart. Wales were almost caught cold soon after, though – Gunter reacting sharply to clear Aubrey David's strike off the line. The offside flag denied Thomas a maiden Wales goal with 24 minutes remaining, but the deadlock was finally broken when Will Vaulks' looped cross found its way to Woodburn, who chested the ball in from point-blank range. While Giggs used this fixture to blood several new players, Wales were also able to afford star names such as Bale, Ramsey, Joe Allen and Ben Davies some rest ahead of Sunday's clash with Slovakia. Leicester City youngster Thomas has impressed on loan at Scunthorpe United this season and he put in an accomplished display in the creative role usually occupied by Ramsey, dovetailing well with eventual match-winner Woodburn. With so many key players rested, it was always likely to be difficult for Wales, but Giggs may be concerned that his back-up brigade took so long to find a way through Trinidad and Tobago's stubborn resistance. - Since losing 1-0 to Costa Rica in February 2012, Wales are unbeaten in their first match of a calendar year in each of the last seven years, winning five and drawing the other two. - This was Wales' first match at the Racecourse Ground since a 3-0 victory over Norway back in February 2008 under John Toshack. - Of players to start the match for both sides, only Trinidad and Tobago's Levi Garcia maintained a 100 per cent passing accuracy rate, completing each of his 16 passes before being substituted in the 60th minute. Giggs will surely turn to his big names when Wales take on Slovakia in Cardiff on Sunday. Croatia, Hungary and Azerbaijan make up the rest of Group E.